Besides LeBron James, IÃ¢â‚¬â„¢d never seen someone who seemed so sure that he was going to make it big, and who had zero problem shouting it from the rooftops. Promoter Lou DiBella, truly one of the good guys in the sport, seemed to have a special feeling about Paulie as well Ã¢â‚¬â€œ which has never gone away, given DiBellaÃ¢â‚¬â„¢s animated celebrations at ringside this past Saturday as his man fought a rematch against Juan Diaz. Of course, Paulie in his early days was not a very impressive fighter to watch. He was elusive, but had nearly zero punching power. As much as I couldnÃ¢â‚¬â„¢t help but like him personally, I didnÃ¢â‚¬â„¢t think his ceiling was particularly high without a major weapon in his arsenal. Five years later, what I realize I underestimated was MalignaggiÃ¢â‚¬â„¢s work ethic and desire to succeed. One thing that hasnÃ¢â‚¬â„¢t changed is that he still probably couldnÃ¢â‚¬â„¢t knock someone out if he had a free shot, but his hand and foot speed have made him an excellent defensive fighter, allowing him to score with his jab at will without generally taking an inordinate amount of damage. Even when completely overmatched Ã¢â‚¬â€œ he lost a war against Miguel Cotto and a blowout against Ricky Hatton Ã¢â‚¬â€œ he displayed toughness that few suspected he possessed. MalignaggiÃ¢â‚¬â„¢s victory on Saturday was a perfect example of how he has learned to maximize his abilities since switching trainers from Buddy McGirt to Sherif Younan. Despite remaining defense-first, he controlled the center of the ring against Diaz, easily both throwing and landing punches at higher volume. He also proved how difficult it can be to trap him against the ropes, literally leaping out of the way of body blows, drawing boos from a testosterone-fueled crowd conditioned to boxers taking a punch to deliver one. But you have to know what fighter youÃ¢â‚¬â„¢re there to see. MalignaggiÃ¢â‚¬â„¢s fights arenÃ¢â‚¬â„¢t generally that exciting, but as long as youÃ¢â‚¬â„¢re capable of appreciating a slick defensive style, theyÃ¢â‚¬â„¢re worth watching. The trait that alternates between charming and grating depending on who you ask is that IÃ¢â‚¬â„¢ve never seen a fighter clown in the ring more than Malignaggi. ItÃ¢â‚¬â„¢s tough to say whether itÃ¢â‚¬â„¢s a defense mechanism against nerves, an extension of his confident demeanor or a way to throw his opponent off his game Ã¢â‚¬â€œ IÃ¢â‚¬â„¢d suggest itÃ¢â‚¬â„¢s some combination of the three Ã¢â‚¬â€œ but Paulie constantly talks in the ring, always sticking his tongue out to taunt the opposition. Does his practice of the craft markedly suffer as a result? ItÃ¢â‚¬â„¢s hard to say exactly. ThereÃ¢â‚¬â„¢s no question that trash talk and demonstrative antics help his confidence, that they put him in a Billy Hoyle-esque zone. But then you have a situation like the sixth round, when he miraculously landed a punch that actually hurt Diaz. Malignaggi was the most surprised guy in the entire arena Ã¢â‚¬â€œ so astonished, in fact, that he had no idea how to follow up, resorting to taunting Diaz until the round ended. But despite that inexplicable tactic, Malignaggi clearly won the fight. All three judges had it 8-4 for him, with a point added on for a very questionable standing 8-count when DiazÃ¢â‚¬â„¢s glove may or may not have touched the canvas. Personally, I scored it 7-5 for Malignaggi, with the difference perhaps coming late with my frustration over his inability to press the issue when he had the chance to take complete control. 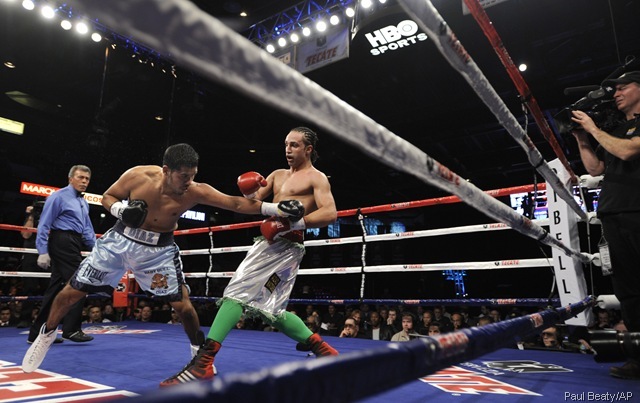 But Diaz failed to put enough pressure on and even when he hit Malignaggi, never appeared to hurt him. 118-110. So to fight in neutral Chicago (in a slightly bigger ring that complemented his skills) was a blessing, and he took advantage by for the most part avoiding the lapses in concentration that spell doom for a finesse fighter. Malignaggi called out Juan Manuel Marquez after the fight, but with Hatton looking into fighting Marquez, he may have to give Diaz a rubber match, which is only fair. Most intriguing, however, would be a fight with EnglandÃ¢â‚¬â„¢s Amir Khan, as Dan Rafael points out. Whichever way he goes, say what you will about MalignaggiÃ¢â‚¬â„¢s careful style and tendency to be somewhat spacey, but after he took DiazÃ¢â‚¬â„¢s NABO Junior Welterweight title, you have to call him a champion. And after you sift through his incessant chatter and slew of antics, you find that heÃ¢â‚¬â„¢s a deserving one.